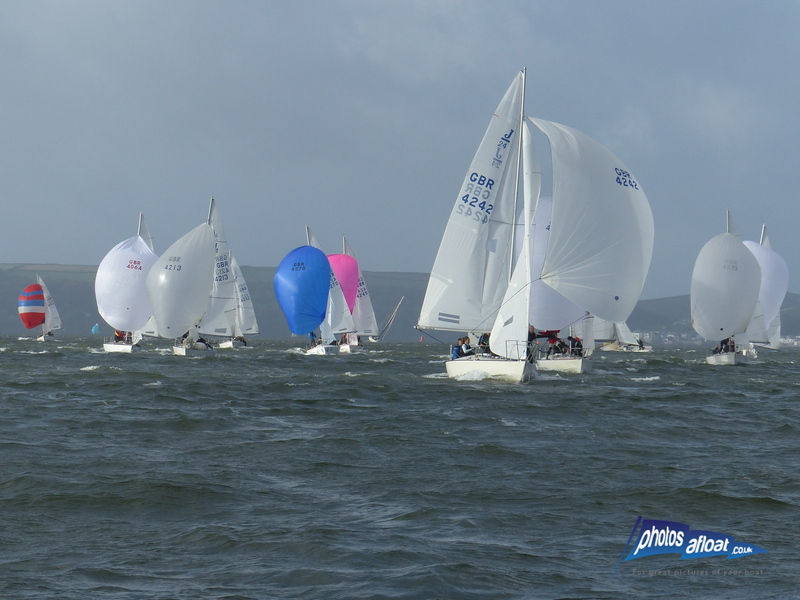 J24 Spring Cup – 18th 19th October 2014 – RWYC Plymouth. 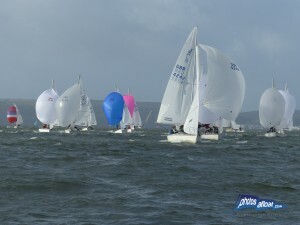 The Postponed J24 Spring cup and world championship qualifier, disrupted due to adverse weather, looked like it could be in jeopardy again as gusts of 35 knots were recorded in Plymouth sound on Saturday morning, but with the winds due to decrease throughout the day, a one hour delay was all that was needed to get the J24 fleet of 14 out racing. Experienced race Officer Neil Dunkley (just returned from finishing 19th at the Laser World Master Championships in Hyeres) set an excellent windward leeward course in the 20 knot southerly breeze. Short legs made for close racing and with an emphasis on the start, there was no room for mistakes. The first two races saw the top two places continuously swapped between Madeline and Cacoon, each time Duncan McCarthy in Madeline coming out on top. Race three with the change of tide, saw a determined Jeli go hard right into the waves and sail an outstanding first beat to then do battle with Madeline for top spot. The swell in the sound started to increase just as the breeze started to fall off, enabling a few genoas to be hoisted at the end of the race with Madeline victorious over Jeli and the ever consistent Jawbreaker holding off Jolly Roger. Sunday dawned with a solid twenty knots but a forecast for it to rise during the course of the day. Race four produced the start of the weekend with Jam Too, Austin Davies, flying up the first beat, just going to show the depth of talent in the fleet and the benefits to be had when you hold your lane off the start. It took a long time for Jam Too to be caught by Jawbreaker, with David Cooper going hard left out of the tide to squeak in ahead of Jam Too, Jeli and then Madeline for what was eventually their discard. With the wind starting to build, race five saw a return to the front of the fleet for Madeline and Cacoon, the bullet eventually going to Duncan McCarthy in Madeline to secure the regatta. Third place for the ever consistent Jawbreaker ahead of Jeli and an improving Jolly Roger, sailed by Roger Morris and his pirate crew. The final race, breeze increasing past 23 knots, provided the opportunity for a port tack cross of the fleet by Madeline only to make their one mistake of the weekend in hitting the top mark. Hitchhiker escaped down the run with trimming speed from Jolly Roger pulling her through to second at the leeward mark. Hitchhiker, helmed by rock star Andrew Taylor dominated the final windward leg, with Madeline, Jolly Roger, and Cacoon fighting for second. In the end it was Hitchhiker, Madeline, Cacoon and Jolly Roger across the line, but consistency won the race for second overall with Jawbreaker having a solid set of top four results taking ahead by a point from Cacoon carrying a sixth place. Class Secretary: Well done Johnny, the new format for 3rd place finisher for writing a report worked well, the greatest of thanks.